The simple pleasure of the phonograph was introduced to me through my parents and grandparents. My maternal grandparents – Grandpa and Grandma Becoskey – had a cabinet stereo with phonograph and radio in their front room next to the television set. I don’t recall the music they listened to, but my aunt lived with them and I remember her playing a lot of Tom Jones. The appreciation of sound entertainment was strongly fostered by my father’s side of the family. In the 1940’s, during his adolescence, my father expressed an interest in playing the banjo. My grandfather spent $5 for a four-string banjo and paid for private lessons. When my dad was around thirteen years old, Grandpa Kitchen found a guy in Highland Park who was selling a used four-string Gibson tenor banjo for $50 and bought it for him. He still has it today. Then, my father and his sister (Aunt Shirley) would perform weekly on WEXL-AM out of Royal Oak. The station was owned by Jacob B. Sparks and located in the Sparks Funeral Home. A small chapel in the funeral home was used as the studio, and my dad on his banjo and my aunt on her Rickenbacker Hawaiian Guitar would be on the air Sunday nights for almost three years in the late 1940’s. My grandmother’s sister – Aunt Menda – had a Wilcox-Gay recording device and had recorded them on 78’s. The device had a radio and two arms for the phonograph. One arm was used to play records in the standard way, moving inward to the center of the record. The other arm would be placed on the inside, and as it recorded onto a blank disk, it would move outward. She would record my dad and aunt off the radio with the device. While going through the 78’s within Aunt Menda’s Victrola, I discovered only one family recording: my Aunt Menda’s wedding. The ceremony included a solo sung by my very young father. My grandfather eventually owned a Wilcox-Gay and a recording was made when my sister and I were young. Very young. There was an infant crying in it, which had to be my sister as she’s the youngest of the Kitchen grandparents’ grandchildren, which put me between two and three years old. It was a classic. I sung the Batman television theme song, in my own style. Instead of the “na na na na na” lyrics, I improvised with “boody boody boody boody.” I’d love to share it but alas, it lies in a landfill today. Both my grandparents and my dad were of the era of radio entertainment. We were brought up on not only television, but the wonderful world of the theater of the mind. Not only the shows of the past. I remember listening to the CBS Radio Mystery Theater which aired, I believe, on WWJ-AM here in Detroit on week nights during the 1970’s. 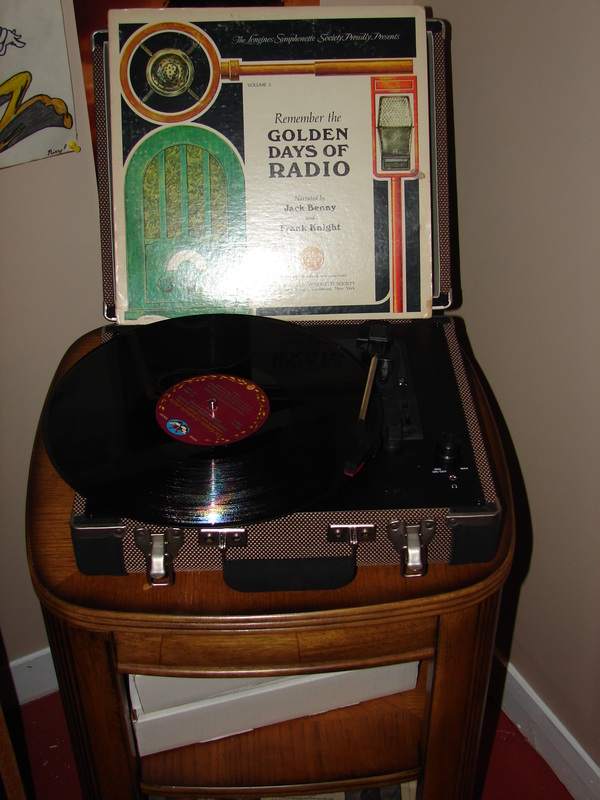 Remember the Golden Days of Radio: Volume 2, presented by the Longines Symphonette Society, was a sampling of how important radio was as the entertainment medium before television. My grandparents had this album, and it takes me back to their home in Garden City, Michigan. I wanted to listen to this album every time I was over there because an eight minute track of The Shadow was chilling and captivating. Take a moment, if you will. Turn off the lights. Don’t watch the video, but listen to it. Put yourself into this excerpt. When I listened to this as a kid, it was frightening, but cool. Listening to it now, I still get the chills of the scene depicted, and appreciate the writing and performances by the actors. Try to listen to this on a computer – laptop or desktop. I imagine the effect is somewhat lost if you play this through a phone, or something with low-quality speakers. The only thing scarier than listening to this album at my grandparents’ house was playing Pinochle with my grandmother and her sisters. Let me tell you. These ladies, who loved their church and loved their religious hymns and gospel preachers, who were the nicest women you’d ever meet, were feisty competitors at the card table. Make a mistake, and not even The Shadow could save you from their chastising! But it was fun and made me the competitor I am today. My Grandparents’ basement. 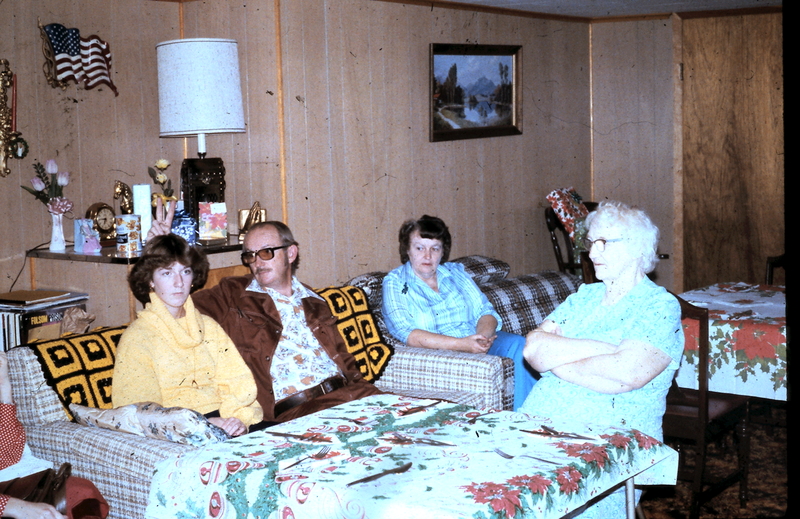 From Left to right: My sister, Marie; Dad, Lester; Aunt Shirley; Grandma Kitchen. Jack Benny and Frank Knight narrate this album, talking about the various shows and events. The Shadow excerpt is the longest track focusing on a single show. The tradition was passed on to the fourth generation by my dad. You can ask my son or daughter who Edgar Bergan, Charlie McCarthy and Mortimer Snerd are, or Fibber McGee and Molly, or, of course, Jack Benny, and they’ll be able to tell you. Old time radio. The entertainment that brought families together almost a century ago, runs through four generations of Kitchens. The Greatest “Eye-Witness” report in history: The Von Hindenburg crashes in flames.